Sponge at the Barbican. Photo: Alix Marina-Chouhan. Squishy, pulpy, squelchy, flabby sponges, to squeeze and pull, bite and squash, watch and throw. Rows of small hands try to reach, grab and throw, giggling and crawling and standing and jumping with excitement. Cellulose creatures come and go, spongy pairs of legs walk in and out and skirts become play-domes. And no, this is not a dream sequence from a Jan Svankmajer film, it’s Turned On Its Head’s show for babies and toddlers, Sponge. Sponge is a visual collage that provides new encounters with a material (clue: it’s sponge), glimpses of characters and playful scenarios. At times, silence descends as the music chimes in and the two bodies on stage (Shane Shambhu and Louise Gibbons) dance in perfect synchronicity, a kind of retro material poetics – blue, green, yellow, red sponges fly in the air, they clean and rub and hide and build. 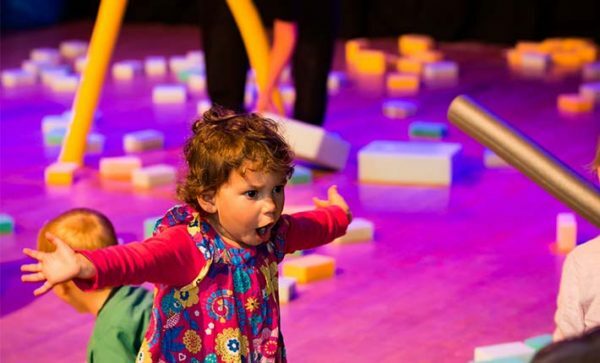 Sponge is an exploration of a material that isn’t held back by any pressures of narrative; instead, it dives into abstraction, just the kind of imaginative, suggestive and open-ended visual and material play that really gets toddlers going – the best kind of theatrical play session. It’s not surprising to find such formal openness with a show for young children – whilst there’s clear engagement here with learning (the show places distinct emphasis on shapes and movement, colour and sound, and plenty of chances to touch and feel, play and dance), there’s also the search for a contemporary theatrical vocabulary that does more than just stimulate – it creates new kinds of spaces. Sponge is on at the Barbican until 21 December 2016. Click here for more details.